They also waived their right to appear in court for an arraignment on a money laundering charge, according to the signed documents.Loughlin’s not guilty plea to charges of conspiracy to commit fraud and conspiracy to commit money laundering is her first substantive response in the case. Prosecutors say she and Giannulli paid $500,000 to a fake charity to get their two daughters accepted into the University of Southern California, falsely designating them as crew recruits.The “Full House” actress is the highest-profile figure caught up in a scandal that has embroiled dozens of wealthy parents, college coaches and standardized test administrators. Prosecutors say some of the parents facilitated cheating on the SATs and ACTs on behalf of their children, and some parents bribed college coaches to smooth their children’s path into college. 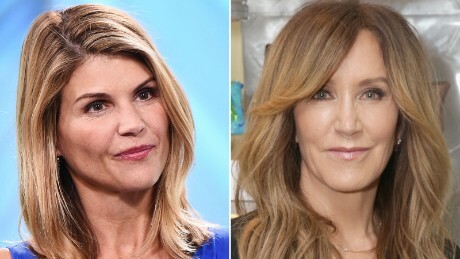 Why prosecutors are putting the squeeze on Lori Loughlin and wealthy parentsLoughlin’s decision not to plead guilty in the case has already had significant legal repercussions.Read MoreThe actress Felicity Huffman was among 13 parents who pleaded guilty to a charge of conspiracy to commit fraud last week. In exchange for the guilty plea, prosecutors said they will recommend incarceration at the “low end” of the sentencing range and will not bring further charges against her.But those who did not plead guilty, including Loughlin and 15 other parents, were charged a day later with a count of conspiracy to commit money laundering. Legal experts said this is part of the prosecution’s “carrot and stick” approach intended to pressure defendants to plead guilty or face further charges.The criminal complaint against Giannulli and Loughlin includes evidence from a cooperating witness, emails, bank records and a recorded phone call with each parent. Giannulli even sent Rick Singer, the mastermind of the scheme, an “action picture” of each of his daughters on ergometers, the rowing machines, according to the criminal complaint.Loughlin and Giannulli appeared in federal court in Boston two weeks ago, but they had not publicly indicated how they plan to plea until now. Each of the two charges are punishable by up to 20 years in prison.The accusations have hampered the careers of Loughlin and her daughter Olivia Jade, a social media influencer. Loughlin was dropped by the Hallmark Channel and other brands in the wake of last month’s charges, and Sephora also ended a makeup partnership with Olivia Jade.